Santana Hotel, 7 Ahmed elmelihy st. veny SQ- Dokki - Cairo- Egypt. Tucked away in a quiet residential area, this basic hotel is close to the Nile, shopping, fine dining and several interesting museums. The hotel is also near to downtown and Egyptian museum and shaping area. It's an open invitation to feel The Santana treatment and enjoy the good hospitality. 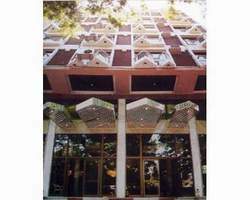 The hotel provide accommodation as carpeted rooms; clean and come with tiny balconies overlooking the shady street below. Santana hotel consists of 80 rooms, is near to downtown and Egyptian museum and shaping area. All rooms with balconies, color TV, air condition, private bathroom and mini-fridge. Santana Hotel Restaurant serves an "A La Carte" menu, oriental food.